So many projects so little time. I was like a whirling dervish for parts of the weekend. I know before 11:00 am on Saturday I had accomplished an insane amount of things. Then it all sort of dropped off and on Sunday I took a two hour nap with Mike and the dogs. That nap was awesome actually, so I make no apologies. 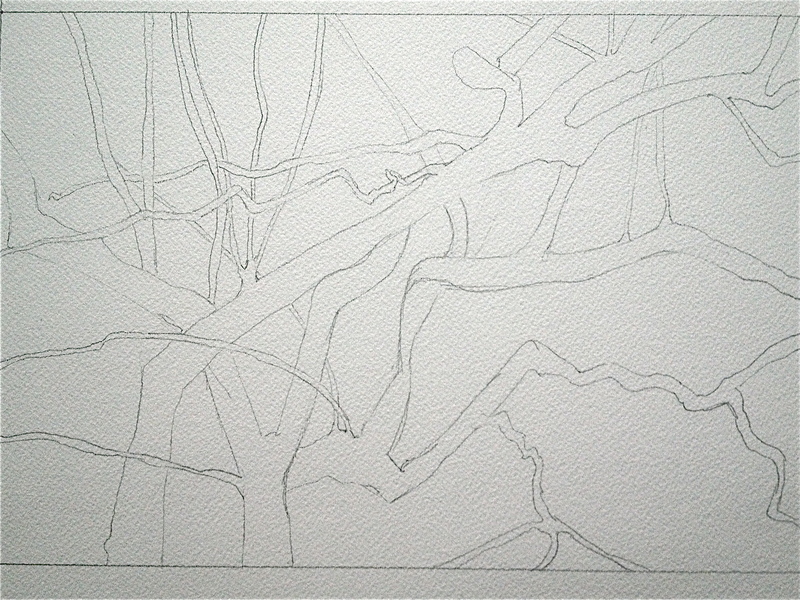 This looks lame right now, but hopefully when I finally move to a 40X60 inch canvas and paint it will all work out. I did start the color work and the good news is that it looks like total crap so far which frees me up to just try the hell out of stuff and not worry about this sketch turning into anything I need to stress about. Occasionally the sketch starts out so good I end up feeling like I can’t ruin it and less experimentation occurs. It’s great when that happens, but it is almost a relief when it’s crap and I get to just experiment for a while. Mike accused me of not wanting to actually paint when I sort of wandered around the house after sketching but I think he figured out that a lot of painting – for me anyway – is thinking about painting. I had a conversation last year with a coworker; both she and her husband are artists. Her husband is all about getting into the studio and having at it. He’s been known to say, “less thinking and talking, more making,” but she is a little more like me in that when she finally sits down to work she kind of has it all mapped out in her head. Two different, but equally valid, ways of working. I might be a bit of both. A little work followed by a lot of thinking. Then a little more more work…and then more thinking. I end up distracted a lot, wandering around looking a little vacant. Truthfully I don’t find painting to be a relaxing activity. It is the end result that is very satisfying. I think that was quite a surprise to Mike. Probably because he enjoys torch work so much. When I do torch work I’m tense, but I still like to do it and am really happy when I end up liking what I made.